Oregon Apollo initiative filed. Sign up now! Readers of this blog know that I get cynical every so often (see posts on Gordon Smith and triangulating Dems) and despite my cynicism, I still like to think the glass is half full, thanks to groups like Onward Oregon. In other words, my cynicism isn't by nature defeatist. While I think the Dems in the DC establishment are a bunch of spineless knuckle heads and the Republicans are criminals, I have a lot of hope in the brave spirits that are helping put together a new vision for our future, especially here in Oregon. Part of that vision here in the Northwest is Oregon Apollo, the ballot initiative that will propel Oregon into a leadership position on new energy technology. Onward Oregon is the launch pad for Oregon Apollo, and the place where you can sign up to be a part of this exciting project. Would you like to hold a house party to help raise money for Oregon Apollo? Want to help gather signatures to ensure that the initiative gets on the ballot? Or maybe you'd like to canvass in your neighborhood? Whatever it is, Oregon Apollo is looking for Oregonians to join them, so sign up today and let's make Oregon the bioneering leader of the nation and the Pacific Rim! Just a quick thought for a Friday afternoon (pre-Rita / post-Katrina): I wonder if the insurance companies are going to start advocating for an energy policy that addresses global warming since the cost of warming far outstrips the cost of fixing it. A few months ago King George told a Dutch interviewer that "Kyoto would have wrecked our economy." I guess he doesn't realize that Katrinas and Ritas slamming into our coastlines for the next ten to twenty years will wreck our economy. Although fixing global warming now, unfortunately, won't change the strength and severity of the storms to come in the next few decades. ...while we cannot draw firm conclusions about one single hurricane, we can draw some conclusions about hurricanes more generally. In particular, the available scientific evidence indicates that it is likely that global warming will make - and possibly already is making - those hurricanes that form more destructive than they otherwise would have been. Will big insurance companies who trade their shares on Wall Street take a second look at global warming? If they live in the Reality Based Community, they will. I didn't realize the O had already done a story on local OSU graduate, Bobby Henderson and his Flying Spaghetti Monster theory when I wrote my post on the theory last week, but while reading today's letters in the O's opinion section today I was surprised to see two letters written in response to the O's piece. Unfortunately, both letter writers were offended by Henderson's humor and seemed to have missed the critical point Henderson is trying to make, which is Intelligent Design does not qualify as science and therefore should not be taught in the science classrooms of America's public schools. ...there still exist giant holes in the theory of evolution that are unexplainable by modern science. Even the simplest organism on earth is a complex "mechanism" of mutually dependent parts. Who can help but stand in awe and wonder on a dark night as they look up at the stars or look in amazement at an ant crawling on the ground and not think our world is more than random chance? 500 years ago people thought the same way about solar eclipses, earthquakes, and a multitude of other natural phenomena. But today those things have all been explained by science. How we feel about solar eclipses, earthquakes and such things, on the other hand, falls into the realm of philosophy. Mr. Jones may feel other worldly wonderment when he looks at the stars and then looks down to see an ant crawling on the ground, but science in the form of physics and astronomy can explain how those stars formed, how old they are, how far away they are from the earth, etc. and science in the form of biology can explain a lot of things about the ant that Jones saw, like the time period when that species of ant in its current form came into existence, what the ant's ancestors looked like, why Jones' ant is different than an ant in India, etc. Just because science continues to successfully discover explanations to our world and universe doesn't mean we have to be any less amazed as Jones implies in his letter. In fact, many of us find the scientific explanations to our existence much more amazing than the more simple explanation of an intelligent creator. But that's a discussion that belongs in another arena. The discussion that Henderson is provoking is about what we decide to teach children in America's science classes: science or philosophical theories. ID theorists are appealing to American's sense of fairness by saying that all theories should be considered. But not all theories in life are scientific, some are philosophical, and others are just down right bogus. That's why Henderson came up with FSM and wrote an open letter to the Kansas School Board urging them to consider his theory since ID has been accepted by the board. He's simply trying to re-clarify the definition of science, which is being obscured by hard right conservatives, in a humorous way to catch people's attention. In the end, science will live on. It will continue to narrow and quite likely close the gaps in Darwin's theory. The question is, will we, as a country, carry on our commitment to teach science in our schools and help propel the next generation of scientific researchers and thinkers into discoveries that will continue to give America its leading edge in scientific research? Or will we hand the reigns over to other countries by forfeiting time in the science class to the teaching of Intelligent Design theory simply because some people assume gaps in Darwin's theory imply the existence of an intelligent creator? Praise be to the Flying Spaghetti Monster! Finally my cold, empty atheist life is no more. 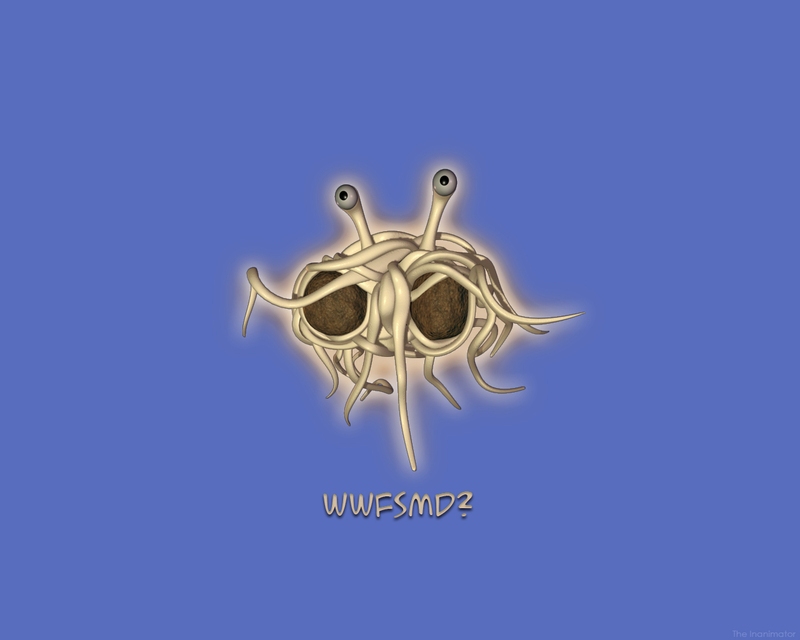 I have found meaning and a much needed moral compass in Him, the Flying Spaghetti Monster. The best part is, there is proof of His existence in the universe, thanks to His followers who have sighted him and scientists and academic experts who endorse His existence. This is exciting for atheists and agnostics, because Intelligent Design just wasn't filling that emptiness we all feel. And thank FSM that Bobby Henderson, a devotee and a holder of a physics* degree from Oregon State University, has had the commitment and loyal devotion to start the Church of the Flying Spaghetti Monster. Could it be that Bobby is the son of FSM? Please take the time to read Bobby's full letter to the Kansas School Board. *The fact that Bobby has a degree in physics from OSU gives even more credence to the FSM scientific theory of creation. Please make sure that when you share the FSM vision with your friends and family that you tell them that Bobby, the founder of the church, has his degree in physics. For those who read the O's pathetic commentary pages, it's quite clear the paper's editorial board hearts Rich Lowry. The board shoves his drivel down our throats by publishing his syndicated column nearly twice a week and fails to balance it out with a twice a week column from someone like Paul Krugman or Molly Ivins. We only get them once a month if we're lucky. ...poverty would be nearly obliterated if every household had one adult working full time and married parents. Ah yes... if only little Johnny had a father who flipped burgers and was married to Johnny's mother who then could stay home with little Johnny. You think I'm being flippant? Lowry actually believes that a parent who works full time at minimum wage, which is $5.15 an hour nationally, isn't poor because of the Earned Income Tax Credit and food stamps. According to Lowry, then, little Johnny has it made and is on his way to Harvard! I don't deny the fact that broken homes hurt children deeply. I know this all too well, but I also don't believe that it is the root cause of poverty. Lowry, on the other hand, thinks that marriage and a full time working parent, even if the work is minimum wage, is the be all end all to solving this country's poverty problem. If only the O would stop printing his garbarge twice a week. Note: my previous post is about education and poverty. Do the odds have to be against them? With the catastrophe of H.K. in the Gulf states Americans can no longer deny the devastating effects of poverty in America. Up until now it's been undeniably easy for so many of us to cruise along in our lives with the feeling of "I've got mine" and that's all that matters. But now that poverty has so forcefully unveiled itself on the TVs of our comfortable living rooms, we can no longer be comfortable because of the new uneasy shame we now feel. We've realized the odds against families living in poverty are worse than getting money out of a slot machine in some cheap bar in Portland. And the odds aren't any better for the children of these families. We know that the children of poverty will quite likely receive a substandard education, because their schools are in districts that are deprived of funding. Only a small percentage of these children will end up with a college education. As a society we end up paying a heavy price for having so many poorly educated children, who then grow up to be poorly educated adults. For one, companies like Toyota decide to build their plants with high paying jobs in countries like Canada where they can draw from a well educated work force. When we fail to educate all of our children equally and fail to offer them all the options that children in, say, the Lake Oswego school district have, we limit our options as a society. We need to create opportunities for families to participate in and contribute to the advancement and general welfare of our society. And those opportunities come in the form of a solid education, which includes college. In the 80s the Reagan administration slashed Pell Grants to the poor. As a result, thousands of poor students across the country had to abandon their education for lack of funds, and thousands of others had the doors closed on them even though they had received acceptance letters from colleges and universities. We need to reinstate a generous Pell Grant system that gives intelligent children living in poverty the opportunity to receive a full college education. Progressive liberalism is about improving the odds for those who have all the odds against them. After all, we're all in this together. Portland's emissions miscalulation. What now? ...after an inquiry into the source of the numbers by a Portland think tank, a city official spotted a mistake in the report: Instead of a 0.1 percent decrease of emissions compared to 1990, there actually had been a .77 percent increase. Ouch! The good news, however, is that the mistake was discovered, which means we're now aware that we are not taking enough action to curb the region's greenhouse gas emissions. We shouldn't be pulling the wool over our eyes on this because it's too important. In an opinion piece in today's O, Richard Page, an associate researcher for the Cascade Policy Institute, claims that the flawed information regarding the city's emissions does a "great disservice" to taxpayers and environmentalists. He goes on to warn that the world should know the truth before it adopts Portland's global warming strategies. Sure, it should know the truth, but at the same time Page seems to be saying that the city shouldn't have enacted any of the measures it took to curb emissions and that other cities should ignore Portland's strategies simply because the city didn't meet the standards it was targeting. What if the city had done nothing? Is that what Page prefers? We'd certainly have higher rates of emissions and we'd be sitting around waiting for someone else to come up with solutions. If Oregon and its largest city are mediocre as some would like to believe, then fine, let's not seek out innovations that might help set national trends and create new opportunities for Oregon's economy. But is that what we want? Our total revenue of sales will be between $8 million and $10 million and we can look at a 15 percent profit margin on that. So we're doing it not because we want to change the energy policy of the United States only, we're doing it because there is an economic benefit for us absolutely. The Oregon legislature had the opportunity to pass biofuels legislation in this past session, but Republican leaders in the House failed to see the vision that Oregon farmers, conservationists and new bioneer business interests could have tapped into. In other words, Salem's House Republicans want to continue the choke hold that fossil fuel based industries have on our state and nation. Did I hear someone say free markets? Richard Page was that you? We can change this, however, by electing leaders who will support and help pave the way toward a bioneering economy. It's an issue that anyone running for office in this state should have to respond to. If a candidate supports the "economy vs. environment" myth, then we should make sure he/she has an opponent who supports bioneering. And we should continue to support Portland's efforts to curb emissions, while demanding flawless reporting on those emission levels. As a community we need to know what works and how we can be improve through innovations that will stimulate our local economy. Olson Online has also blogged about this, specifically on the O reporter who keeps citing libertarian/conservative sources for his articles without including the views of conservation groups who also have an interest in the global warming issue.